Boxers are a bundle of joy, happiness, and energy. The Boxer is typically medium-sized with short hair, which is perfect for the hot Miami weather! They are generally well mannered and get really excited about everything. Guaranteed to always make you smile! Owners we’ve spoken to have called their Boxer playful, devoted, intelligent, friendly, energetic cheerful and many more great things. Here are some of their amazing characteristics. 1. Boxers can be a little cuckoo. 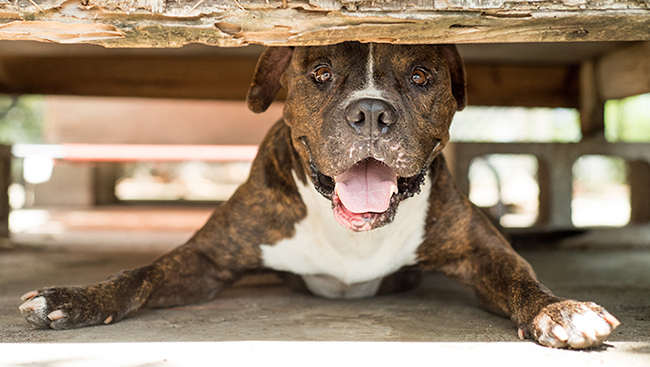 Boxers have so much friendly energy that sometimes they might be rambunctious and like to run and jump around on occasion. They are the goofball dogs by excellence. As they get older they become calmer while keeping their happy outlook. These dogs love people and the breed is more in the “people dogs” category, Boxers love the company of adults and kids. Be warned! They don’t know the meaning of personal space and will try to be as close as you as possible. 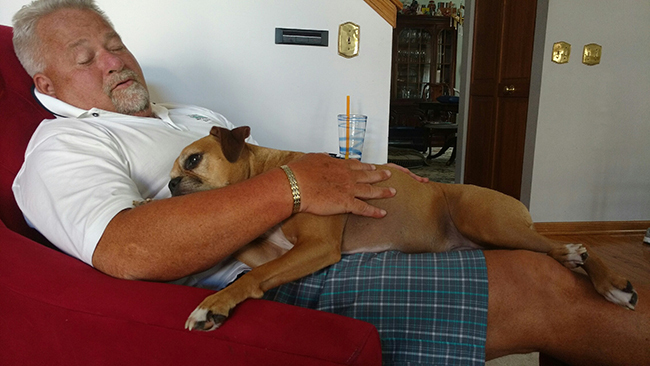 Boxers are forever lap dogs. Compare Boxers to a 3 year old kid who never grows up and always wants to play. They love to entertain their families with their goofiness. 4. Boxers are called Boxers because they will try to show you affection by pawing at you. They will stand on their back legs and paw at you with their paws trying to play with you and get your attention. These dogs love to play and get lots of exercise to drain all their energy. Training and mobility courses are great for them. You will have a happy, active and healthy life with them. Make sure you take precautions for the hot summer in Florida as this breed tend to overheat. Here are some tips to keep in mind to keep your dog safe in the heat. 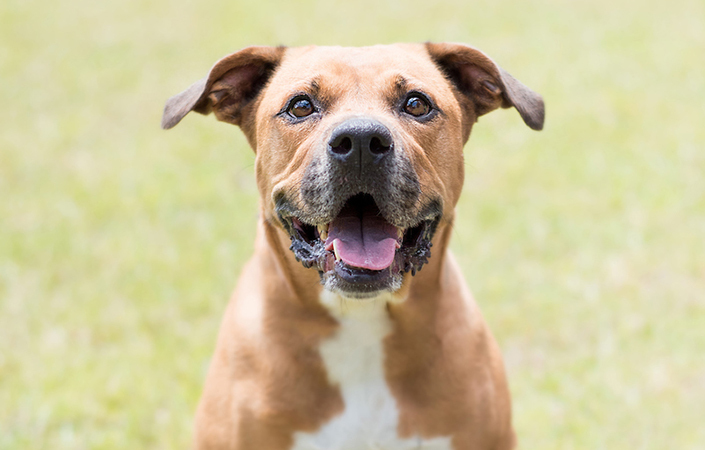 Check out our Boxer and Boxers mixes here at Born Free Pet Shelter! 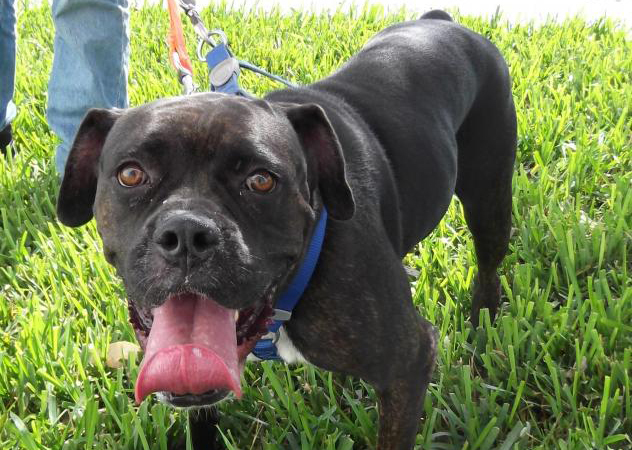 Claudia is a sweet, happy and goofy girl who loves people. She was found as a stray and brought to the shelter. Here are some words from the person who found her. “Whomever will adopt Claudia would be very lucky. We found her abandoned in a house and brought her home. She is amazing, happy, sweet, loving and loves to be pampered! She gives the best hugs. Unfortunately, we couldn’t keep her but you can enjoy her company”. 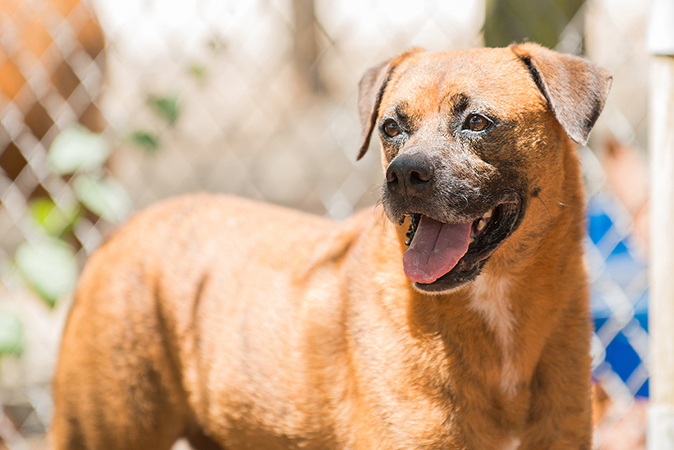 Freeway is a Boxer mix who has the cutest face! He is not your typical Boxer. He is a little smaller than the traditional Boxer and he is actually very calm and sweet. Freeway gets along with other dogs, though he might be a bit shy at first he enjoys being petted. This brindle boy is the biggest lover around once you give him some pets. Bruno is a 2 years old, as of June 2017, Boxer who loves people! He is the type of dog that will soak up all the love you can give. A few of his favorite things are people, cuddling and play time! He is a confident, happy, affectionate and goofy dog. Golda is full of enthusiasm and energy, she needs to join a family with adults or older children who can give her love and provide her exercise, discipline, and training. Frik is a 2-3 years old Boxer. 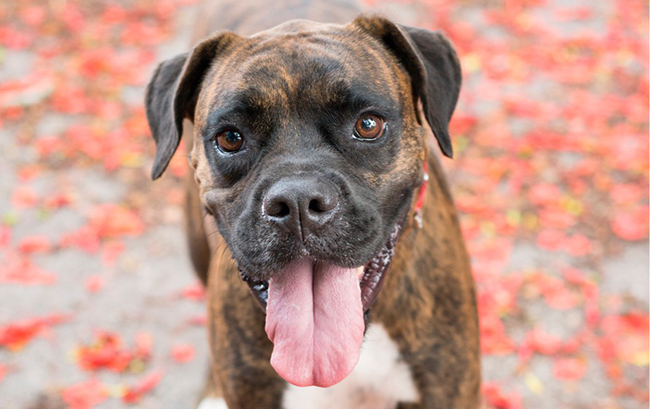 She is a beautiful and energetic Boxer. She is a little shy and needs a patient person who can give her the love and affection while providing discipline, training, and exercise. We hope you’ve enjoyed our facts about Boxers and love them as much as we do! If you’re interested in adopting any of the dogs here or would like to check our all of our dogs, let us know! Born Free Pet Shelter has a couple cool t-shirts designed by Happy Rescue Tails and we’ll be adding more soon! All profits from these sales will be donated to Born Free Pet Shelter. Check them out! The hot summer months are approaching, especially here at Born Free Pet Shelter in Miami. While Summer can be a lot of fun in the sun playing and swimming with your pup, the heat can also be dangerous. We can help you keep your pets safe and cool this summer. Not even for a second. Not while you run inside to grab something real quick. Not ever. Even on a cool day, it can get hot really fast in a car, windows up or down. When it’s 72 degrees Fahrenheit outside, the temperature inside your car can heat up to 116 within an hour. When it’s 80 degrees Fahrenheit outside, the temperature inside your car can heat up to 100 in 10 minutes. Rolling down the windows has been shown to have little to no effect on the temperature in the car. Your pet can quickly suffer brain or organ damage within a couple of minutes in a hot car. If you want to take your dog with you, make sure you go places where you can bring it inside. If you come across a pet in a car that appears to be in distress, take action. In Florida, it is legal to rescue a person or domestic animal that is in danger in a locked vehicle. According to the bill, it provides immunity from civil liability for damage to a motor vehicle related to the rescue of a person or domestic animal under circumstances. Call 911 immediately after rescuing the child or animal and make sure to wait for first-responders to arrive. On hot summer days, try to keep outdoor exercise to the mornings and late afternoons. Try not to be out during the hottest time of day. If you are outside, ensure you have plenty of fresh water available and take moderate breaks. Heavy panting, glazed eyes, a rapid pulse, unsteadiness, a staggering gait, vomiting, or a deep red or purple tongue are all signs of heat stress. If your dog shows any of these signs, be sure to gradually lower his body temperature with cool (not cold) water. Try soaking him in a bath or pool. 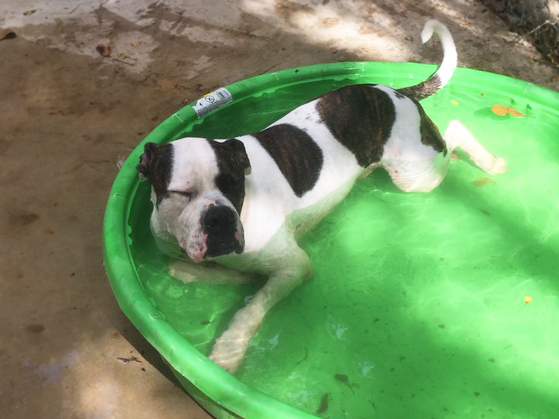 At Born Free Pet Shelter, we have a kiddie pool for all of our dogs that they love to sit in on hot days. Check out Mickey below relaxing in his pool! If you do not have a pool or bath available, take a wet washcloth or paper towel and wet the ear flaps and paws. Make sure to offer your dog fresh water but do not force them to drink. If your dog shows these signs of heat stress, you should take them to the vet after you can cool them down. When walking, watch out for hot surfaces. Try to stay off hot surfaces in the middle of the day. Test it first with your hand, if it’s too hot for your hand, then it’s too hot for your dog’s paws. Hot surfaces like asphalt can burn your dog’s paws, try walking on the grass. You can also look into booties for your dog in the summer but be careful that they aren’t wearing those for too long on hot days. Dogs can burn in the sun just like you and me. 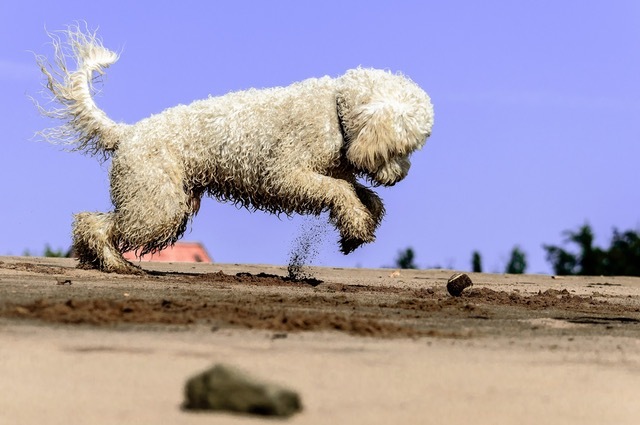 Watch out for the sun, especially for white, light-colored and thin coat dogs. Sunburn will cause pain, itchiness and other problems for your dog. Use waterproof baby sunscreen on days in the sun on your dog’s ears and nose. Hopefully these summer tips will help you and your dog have a great summer! While these are good general tips, just make sure to use common sense with your dog. No one knows your dog better than you. Don’t be afraid to let your dog enjoy summer and run in the sun, just use precaution and everything in moderation. Let us know what your favorite thing to do in the summer is with your dog! American Bulldogs need more publicity as it has so many wonderful qualities that are not known. American Bullies are very lovable dogs that despite their tough appearance are very sweet, smart, and happy dogs. We have collected interesting facts about this breed that we’d love for you to share. Even though some American Bulldogs appear muscular and big, don’t let this fool you, they are in fact very sweet and good natured dogs. They are very good with kids and very loyal. American Bulldogs are confident dogs who are good with people! They ranked really well in the American Temperament Test Society, their behavior is so good that they even rank higher than breeds like Golden Retrievers, Pomeranians, Beagles and Cocker Spaniels. They are very easy to maintain as they have short hair and moderate shedding. Which is great for Miami or Florida summer weather! American Bulldogs are vigorous and have lots of energy; they need to be taken on long walks. If you like biking or jogging, these dogs are for you! They will happily run along with you and require a lot of exercise. Make sure to be a strong leader as they can be a stubborn and need the right leadership to guide them. If you have an active lifestyle or are seriously thinking about starting one, bully breeds will be a great match for you! 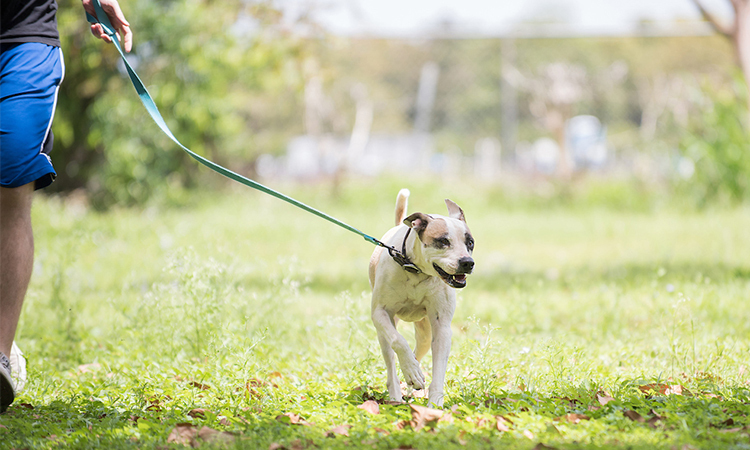 Born Free Pet Shelter Advice: Try going on daily walks on your own before you get a new active dog to make sure you can commit to giving your new pup the exercise he needs. 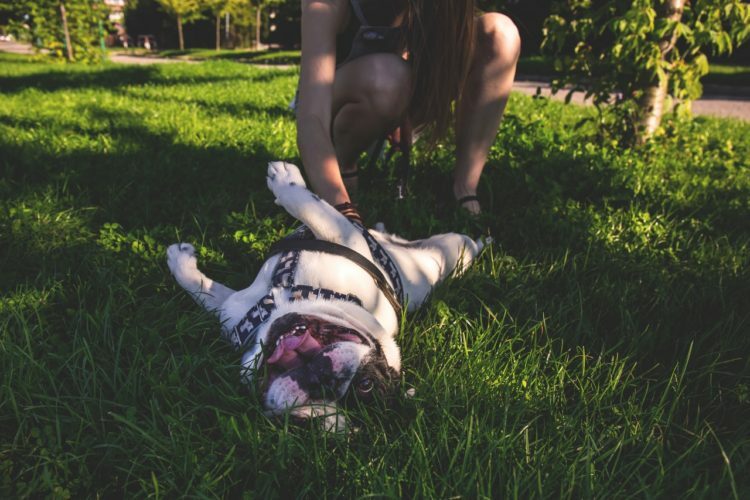 Dog training is wonderful for American Bulldogs and recommended as it can help them to prevent boredom. It will also help them understand that they need to follow you. Just simple easy tasks like “sit”, “stay”, “down” and “come” will be great for them. Here is an easy guide on how to teach tricks to your dog. Bully breeds are easy to train as they are very intelligent and love pleasing their owners. They can be a strong breed and need a pack leader who gives them boundaries and limitations. Bullies need to know they are not the “Alpha Dog” and are happy to receive guidance and direction. Mickey is our spoiled dog. 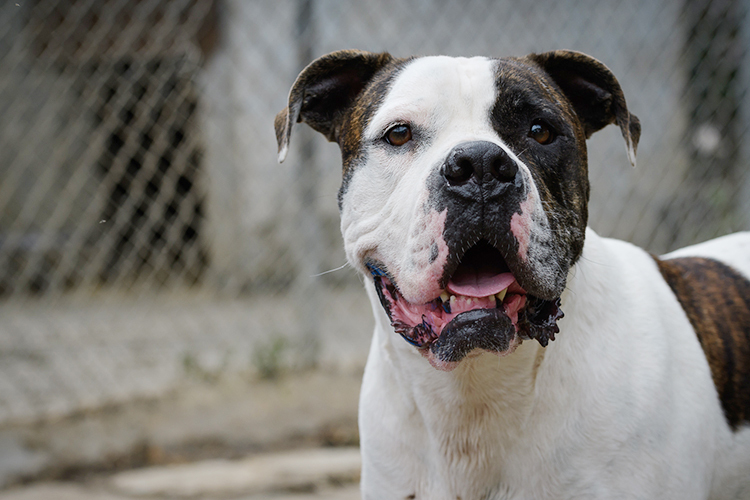 He is a very handsome young dog who arrived at the shelter as a puppy and a typical American Bulldog. 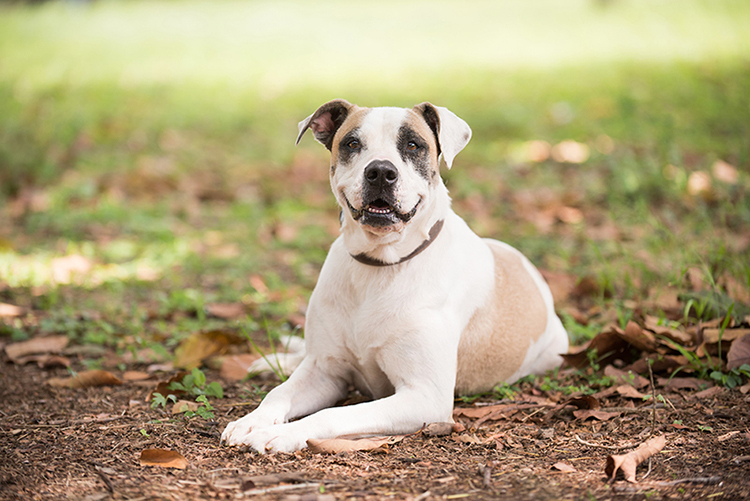 Mickey loves meeting new people, love belly rubs and is very energetic. He needs enough exercise and proper leadership from his new owner. Mickey will be great for an active family or person. We called him Mickey because he has markings that resemble the shape of Mickey Mouse! He is a happy dog that will always make your smile. Meet Bones! 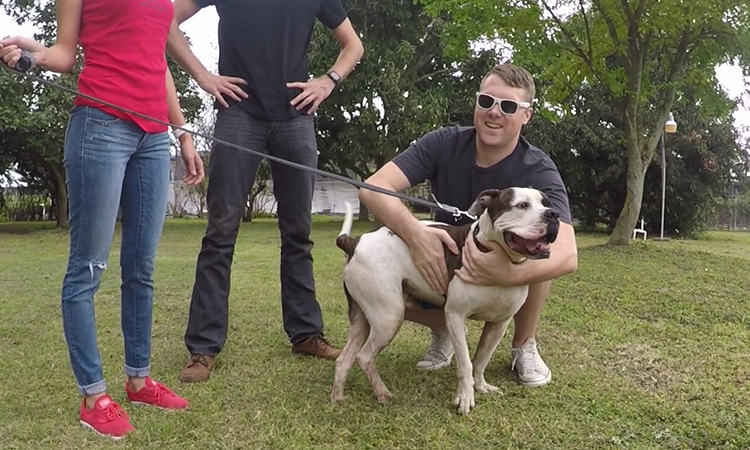 Bones is truly a gentle giant. He might look very muscular but he is a real sweetheart. His dream is to be a lap dog! He is one of the favorites of many volunteers due to his very sweet behavior. He is calm and enjoys lounging in the sun, exploring the yard, and greeting the volunteers with a smile. These and more wonderful dogs are up for adoption at Born Free Pet Shelter. 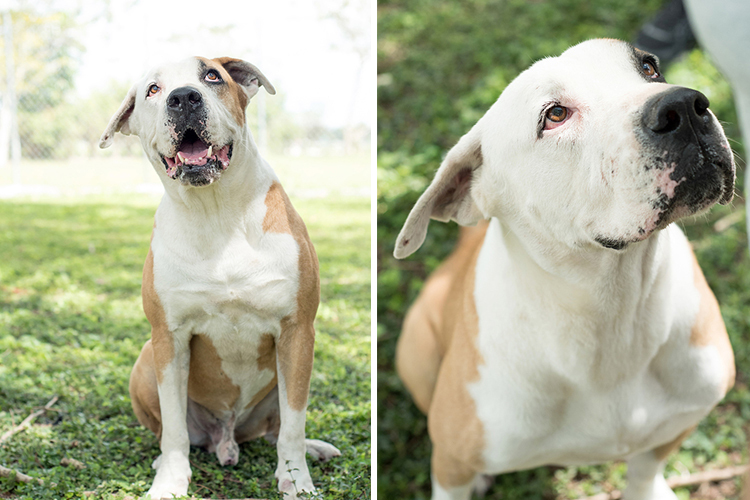 Please email us at bornfreeshelter@gmail.com or call Maria at 786-205-6865 to meet them!